One of my all-time favorite lines in one of my all-time favorite scenes in one of my all-time favorite movies: Chariots of Fire. Eric Liddell, walking on the lush green hills outside Edinburgh, explains to his beloved sister Jenny why he is training for the Olympic Games rather than spending all his time preparing for missionary work in China. I admit it: whenever I hear Vangelis's famous theme and see those scores of feet thumping the beaches of St. Andrews, I get as teary-eyed as some get watching Rocky Balboa run up the steps of the Philadelphia Museum of Art. Eric Liddell's conscientious stand against running on Sunday and record-breaking victory in the 400–meter finals won him a measure of cinematic immortality, and Chariots of Fire won several Academy Awards. But the real race of Liddell's life is told only in the epilogue. After winning his gold medal, he fulfilled what he believed was God's ultimate purpose for his life: He went to China, cared for the sick and wounded in war-torn areas, was imprisoned with other foreigners in a Japanese internment camp, and died there. This much harder contest, the test of Christian courage and commitment in the face of war, persecution, and suffering, was one that thousands of Chinese Christians had to face over the course of the 20th century. As the world prepares for the 2008 summer Olympics in Beijing, China's past violations of human rights and religious freedom and its current dealings with Tibet have become a topic of international controversy. We have yet to see what the fallout will be for both the state-registered and unregistered Chinese churches, which have been bursting with new life for decades despite numerous limitations. It's impossible to understand the dynamic growth—and unique challenges—of Chinese Christianity today without looking back at the events of the last century. And when we do, we find a remarkable story of endurance and innovation, courage and creativity, intense suffering and transformative action. 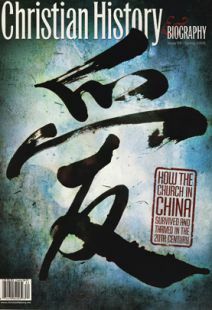 The Chinese church has been like bamboo, that ubiquitous Chinese symbol of strength, flexibility, and perseverance—growing even in the midst of harsh conditions, bending but not breaking in the wind. Many, many thanks to Dan Bays, Carol Hamrin, and Stacey Bieler for all of their additional help in planning and preparing this issue of the magazine for publication. We could never have done it without them.